This building looks so cool, I just had to share it. 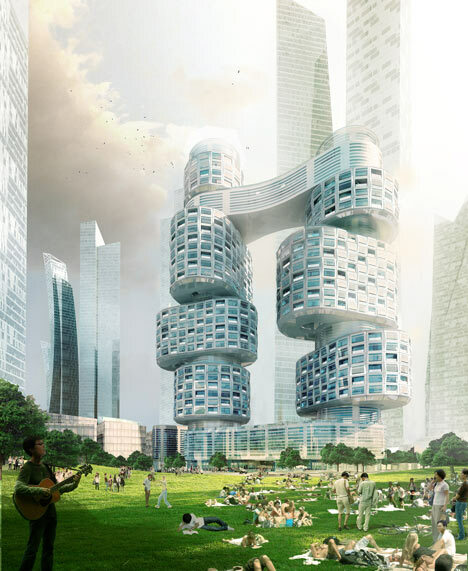 It's a design proposal for a new skyscraper style apartments in Yongsan, Seoul. When I lived/worked in Korea, I remember going to Yongsan with my friends whenever they wanted to buy a new electronic gadget. There are SO many vendors there selling the latest cell phones, cameras, and bootlegged copies of DVDs. Kind of reminds me of Jong-ro tower building that I used to see everyday while working near there. Like a good Korean ajumma, I usually buy kimbap from the local Korean store. But yesterday, I got with my friend Anya and we made kimbap together, with a little bit of help from our boys. Read Anya's lovely post about our day, complete with pictures, here. While living in Korea, I got to eat all kinds of kimbap. Most of the kimbap stores had tuna kimbap, cheese kimbap, and one of my favorite, kimchi kimbap. I got some kimchi from the Korean store, chopped them up and put them in a few of the rolls. It turned out really yummy! The kimchi was nice and fermented. The kimbap we made must have been even more delicious than the ones I buy at the Korean store because my son Christian isn't usually too big of a fan of them but these he gobbled up right away! They were a hit with the rest of the family too because I left four rows at home for dinner, and they were all gone when I got back! Have you ever made kimbap at home? How did they turn out? What are your favorite things to put in the kimbap? My kids have been out of school since Memorial Day Weekend but most local schools got out some time after. We have LOTS of summer plans: breakfast at 9:30 am, scoops of ice cream at 9 pm, overnight week-long camps for the kids (2 sessions) and mini-vacays for the adults, day camps with specific actvities (tennis, ASPCA, etc. ), roller coasters, water parks, reading and math enrichment sessions, open camp fires, amusement parks, the beach (already been once so far), state parks, national parks, s'mores!, slumber parties, birthdays, "spa" days, swimming at the pool, neighborhood block parties, camping, the river(s), reading, visits with Ms. Beth at the library, arts and crafts, lakes, fishing, gardening, movies, at home movies and much, much more. And of course day trips to the parks and area lakes and rivers will include gimbap picnics and galbi bbq! Angie in Texas LOVES summer! Not so much the Texas heat.